Deicing Fluids – Download the document to read some details about aircraft deicing fluids and procedures. A tailstrike occurs when the tail of an aircraft touches the runway during takeoff or landing. Tailstrike at landing often occurs on the second touchdown, following a bounce. It is often associated with a hard landing. It can occur with any type of aircraft, although tailstrikes occur more often with long aircraft, because tailstrike occurrence is directly related to pitch attitude versus aircraft geometry, and the status of main landing gear extension. The purpose of this document is to provide an understanding of aircraft operations in cold weather conditions, and address such aspects as aircraft contamination, performance on contaminated runways, fuel freezing limitations and altimeter corrections. RAAS Remote Alternate Altimeter Setting has been removed from many plates. Removal ceased in April of 2000 but no removed RAAS is planned for reinstatement. This leaflet provides guidance material for the approval of aircraft and operations in the European region where Precision Area Navigation (P-RNAV) is required. It relates to the implementation of area navigation within the context of the European Air Traffic Management Programme (EATMP) and should be read in conjunction with EUROCONTROL document 003-93(), Area Navigation Equipment: Operational Requirements and Functional Requirements. L — LIGHT, to indicate an aircraft type with a maximum certificated take-off mass of 7000kg or less. This edition incorporates all amendments approved by the Council prior to 27 May 2008 and supersedes, on 15 November 2012, all previous editions of Doc 4444. NOTE 2: If the letter Z is used, specify in Item 18 the other equipment carried, preceded by COM/ and/or NAV/, as appropriate. NOTE 3: If the letter J is used, specify in Item 18 the equipment carried, preceded by DAT/ followed by one or more letters as appropriate. NOTE 4: Information on navigation capability is provided to ATC for clearance and routing purposes. NOTE 5: Inclusion of R indicates that an aircraft meets the RNP type prescribed for the route segment(s), route(s) and/or area concerned. S Transponder — Mode S, including both pressure-altitude and aircraft identification transmission. EET/ Significant points or FIR boundary designators and accumulated estimated elapsed times to such points or FIR boundaries, when so prescribed on the basis of regional air navigation agreements, or by the appropriate ATS authority. RIF/ The route details to the revised destination aerodrome, followed by the ICAO four-letter location indicator of the aerodrome. The revised route is subject to re-clearance in flight. REG/ The registration markings of the aircraft, if different from the aircraft identification in Item 7. SEL/ SELCAL Code, if so prescribed by the appropriate ATS authority. OPR/ Name of the operator, if not obvious from the aircraft identification in Item 7. STS/ Reason for special handling by ATS; e.g., hospital aircraft, one engine inoperative; e.g., STS/HOSP, STS/ONE ENG INOP. TYP/ Type(s) of aircraft, preceded if necessary by number(s) of aircraft, if ZZZZ is inserted in Item 9. PER/ Aircraft performance data, if so prescribed by the appropriate ATS authority. COM/ Significant data related to communication equipment as required by the appropriate ATS authority; e.g., COM/UHF only. DAT/ significant data related to data link capability, using one or more of the letters S, H, V and M; e.g., DAT/S for satellite data link; DAT/H for HF data link; DAT/V for VHF data link; DAT/M for SSR Mode S data link. NAV/ Significant data related to navigation equipment as required by the appropriate ATS authority. 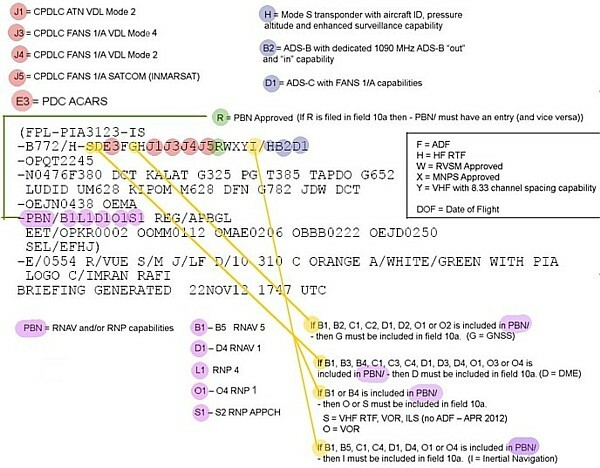 DEP/ Name of departure aerodrome, if ZZZZ is inserted in Item 13, or the ICAO four letter location indicator of the location of the ATS unit from which supplementary flight plan data can be obtained, if AFIL is inserted in Item 13. DEST/ Name of destination aerodrome, if ZZZZ is inserted in Item 16. ALTN/ Name of destination alternate aerodrome(s), if ZZZZ is inserted in Item 16. RALT/ Name of en-route alternate aerodrome(s). CODE/ Aircraft address (expressed in the form of an alphanumerical code of six hexadecimal characters) when required by the appropriate ATS authority. RMK/ Any other plain language remarks when required by the appropriate ATS authority or deemed necessary. CROSS OUT U if UHF on frequency 243.0 MHz is not available. CROSS OUT all indicators if survival equipment is not carried. CROSS OUT D if desert survival equipment is not carried. CROSS OUT M if maritime survival equipment is not carried. CROSS OUT J if jungle survival equipment is not carried. CROSS OUT all indicators if life jackets are not carried. CROSS OUT L if life jackets are not equipped with lights. CROSS OUT F if life jackets are not equipped with fluorescein. CROSS OUT U or V or both as in R/ above to indicate radio capability of jackets, if any. (COLOUR) INSERT colour of dinghies if carried. A/ (AIRCRAFT COLOUR AND MARKINGS) INSERT colour of aircraft and significant markings. N/ (REMARKS) CROSS OUT indicator N if no remarks, or INDICATE any other survival equipment carried and any other remarks regarding survival equipment. C/ (PILOT) INSERT name of pilot-in-command.